This beautiful woman’s story has continued to remain and replay in my mind since we have returned to America. Although I cannot remember her name specifically, her story remains just as powerful. On our last day at Maai Mahiu we traveled to the Internally Displaced People camps to visit members of Rift Valley Fellowship who live within the camps. IDP camps are refugee camps where many people fled to after the violence in the 2007 election. 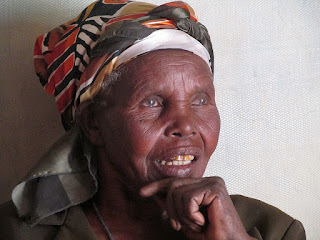 During the election there was intertribal violence and many of the people’s homes were set ablaze, which forced people like her to flee to the IDP camps. People fled to the camp and lived in tents for survival, until Habitat for Humanity provided homes for the individuals there. While visiting the people of these homes, this woman stood out to us. We entered her home and were greeted by a handshake that included her winding in for a slap upon your hand, while she pulled you in for a hug and pat on your back. There was a sense of zest and life to her that immediately lured you into knowing her character. We stood in her home and soon found that she was quite the woman. Her story told of raising children on her own since her husband left her and the trials she and her family faced upon entering the IDP camps. However, her story was a bit different than the rest. While we were in the homes of the Rift Valley Fellowship church members, we would end our visit with prayer for the family’s needs, but I was shocked at what her need was. We were informed that she always asks for prayer for others, such as her family or community members who have a need. There she was, with such a heartbreaking story but she desired to pray for others above herself. Although we did find out from our translator later to pray for her physical needs, we were told to pray for the “others” in her life who she thought needed the prayer more than she did. We have learned throughout much of our course that within the African culture family is of such high value, which typically includes a unique sense of community that America is not used to. Through the example of this woman, I saw that in full display. Her desire to put others above herself is something that is not seen as much within our culture. Often, we are self-absorbed and long to have it “all about me.” This striking woman placed herself last. Her sense of complete humility impacted me significantly. I have printed an enlarged version of this picture and plan to hang it in my room as a reminder to remove my self-centered ways. Let’s start making our hearts more like hers, which seeks the needs of others above our own.